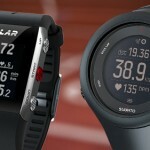 TomTom has released the Spark as the successor of the MultiSport and Run watches. The new Spark model (sometimes called Runner 2) also comes with a new optional feature to play music using a bluetooth headset. 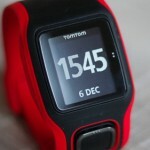 It’s the next step of TomTom’s move in the sports market and it’s a nice one. For the new model the watch was also sent to fat camp and lost some weight. It weighs (with cardio) about 46 grams (=1.6 ounces) (take or leave one for the small/big strap). This is around the same weight as the Garmin ForeRunner 225 (53g). The watch is branded as Multi Sport as it has profiles for Swimming, Cycling, Running, Gym (cross fit for example), Indoor bike, treadmill and freestyle. TomTom also changed the wristband. It’s no longer a ‘classic’ band with a little buckle. The new band has the little pins we’ve seen before on the Runner. But they’ve now integrated them into a new type of buckle. This allows you to put the watch on much easier with one hand and taking it of is just as quick. It’s an improvement in my book. The wristband comes in a small and a large. I have tiny wrists, only 6.5 inches (16.5cm), but I have about 4 holes left on the large wrist band or it would be too big. The small wristband is a better fit for me. It’s also less wide making it look just a bit less bulky. On the small band I have about 4 holes left too, but then in the opposite, so I’m not allowed to get a lot fatter. If you pick up a Spark second hand, you can get a fitting wrist band separately without any problems, they come in some nice colors too. Note for duathletes or triathletes: There is no multisport-profile. When you do a race, I’d recommend using freestyle for the swim (if it’s open water) and change profiles when you run into T1 and T2. So it won’t measure your transition time and you have to stop and start different activities. Not a real big deal, you can get your t-time from the official timing anyway. The display is made of eInk and because of that, it’s black and white and crystal clear with a high contrast. I was misinformed on the technology behind the screen. It’s actually a high contrast monochrome LCD. Pebble uses the same type of screen and calls this e-paper. So that’s a bit cheeky and probably where (in translation back and forth to my native Dutch) I have confused this with eInk. Anyway, Garmin likes to go full color, but the readability is suffering because of it. The screen of the Spark is very clearly readable in almost any situation and angle. Bonus: if it’s dark, just cover the watch with your hand and the backlight kicks in. I’ve been trying to find out just what makes the light come on, if it’s a corner, conductivity or amount of cover, but I don’t actually know. Fun fact, it does randomly switch on in the shower. You can also enable the light by default by putting it in ‘night-mode’. Useful during the shorter days of the year, as the screen light will stay on during your entire session. The TomTom is controlled by the square button at the bottom. It’s not a rocker, it’s just like it’s predecessor. The center is the GPS receiver and around it is the 4-way button. All navigation is done using this button. A change from the last series is the naming of all the versions, more on that later. Also, TomTom switched manufacturers for the optical heart rate sensors. They no longer use the Mio optical heart rate monitor but switched to a new company called LifeQ. Where using new or unproven technology is always a risk, I have not seen a big problem when using the device. So performance wise there is no notable change, however, with TomTom being the main client of LifeQ they can have a big influence. Where with Mio, TomTom is just another client. Currently the technology is up to par with the Mio that was built in the previous watches but LifeQ is saying they can read out HR-V and calculate VO2 max. So hopefully TomTom will work together with them and release these features in a firmware update as VO2 would be pretty impressive! The green flashing led looking for a pulse. After it’s completed you can eject the watch and the music is there. If you just want to listen, go UP with the buttons and the Spark will scan for your headphone. (This is also a way to pair one, right now by putting the headphone in pairing mode.). Once it found a headphone set it knows you get to choose from your (just synced) playlists. Choose the one you want, and done. Please excuse the quality of these photos. My ‘good’ camera was out of battery. Music is playing in watch mode. 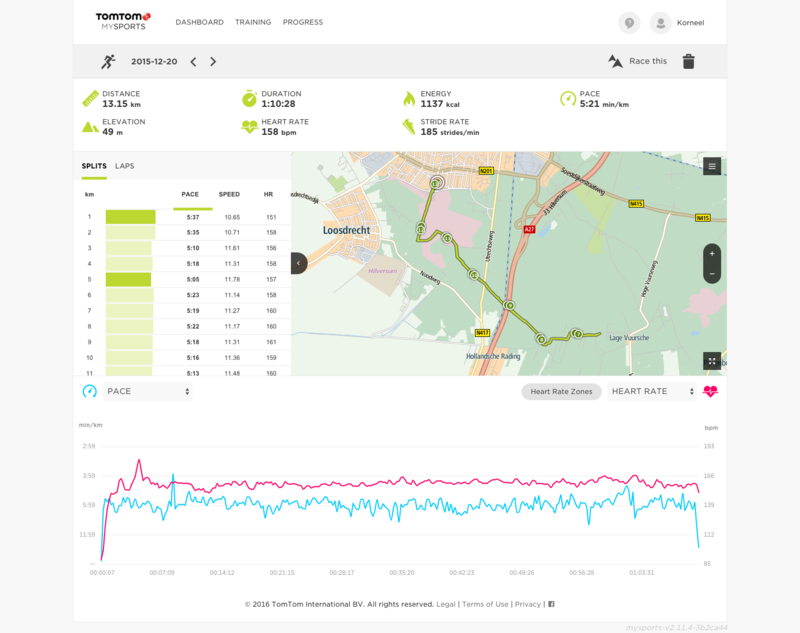 During my first run I threw the advice of the TomTom rep. into the wind and wore the Spark on my right arm as I had a Garmin on my left to compare data. The rep. had told me that the receiver of the headset is on the left side of it and it may have problems with the connection when you wear the watch on your right arm as bluetooth is not good in going through your head. So I indeed encountered the issue and the music was a bit jolty at times. Putting the watch on my left wrist seemed to indeed solve the problem. The headset seemed very bulky to me and the design made me wonder if it would work for everybody. At first it looked like it wasn’t a great fit for me, but I’m happy to say I had no issues with it during the run. It stayed in place and I didn’t have to keep pushing it back (as I do with some other ‘in-ear’ solutions). So in spite of my prejudice it worked perfectly as designed! But if you already have Bluetooth headphones you can use those too. Pairing is very easy. The TomTom headset has three buttons, + a middle and a – button. The middle is on/off/pair. To pair the headset, make sure it’s turned off and then press the button until it pretends to be a police car (blue & red led’s flashing). On your watch go up from the clock screen and the Spark will pair with your headset. The control on the headset. Headset found! Tunes start playing. With the addition of the +Music the Spark is great for, well, running. The GPS is quick, especially with the QuickGPS you can walk out and basically start within 5 seconds. To start running, you navigate -> right from the clock and -> right again. Run mode. Go up or down to select other sports. GPS: Check. HR: Check! Ready to GO!! Press right once more and you’re off. As with the other sports, you can set a training goal or start an interval session and control what data is shown in the bottom two fields. Setting the goal is useful, I like to go on 25 minute runs now I’m back and healthy again and the time goal works like a charm. You get an extra screen which indicates the percentage of your goal and a notification at 50% and 90%. So at the 50% mark, I just turn around and start stumbling back. As always, I’m back exactly where I started when I get the 100% notification. Really handy for a run in a city you’ve never been for example! One thing I did miss is running cadence, you can use an optional foot pod, but since the Spark can actually take swim lanes and stroke, I would assume the motion sensor would be able to pick up running cadence. It’s not there but maybe they can add it in the future. One thing I was particularly interested in was the reliability of the HR sensor during cycling. 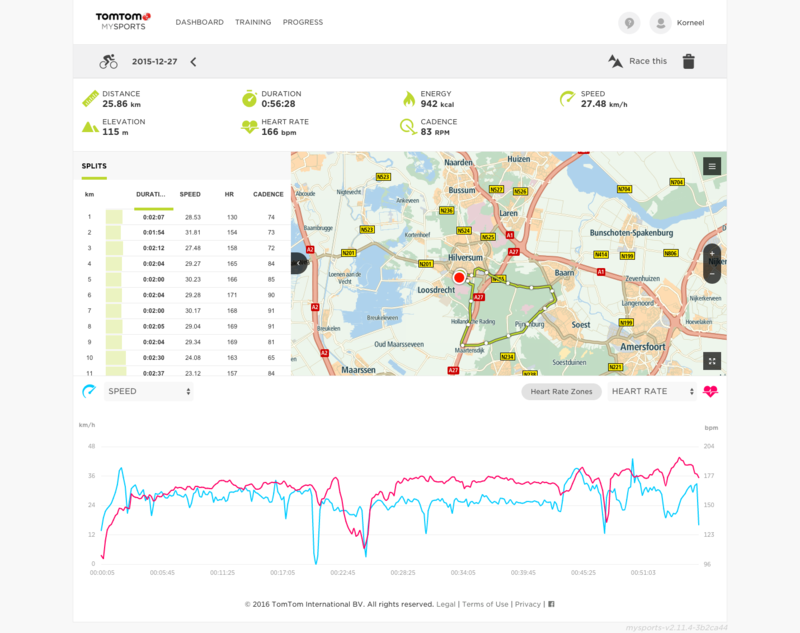 And to be honest, the HR monitoring is OK. Not great or super accurate, but acceptable considering that, when cycling, you hit a bump in the road the watch will get a bump too and lose the tracking of your heart rate, unless you put it on SUPER tight. So the road is not smooth, your wrist is shaking continuously and the outside light interferes. TomTom could have looked at the Garmin 225 model which has an extra rubber ring that blocks out and potentially solves this issue. But overall, the averages do come out quite accurately, as you can see below, so it’s not a huge deal. Definitely not a deal breaker. Now if you look at the following graph I recorded a 45 minute ride with the Spark and a Garmin Edge 520. While the Spark is pretty accurate it does have some weird drops I can’t explain, this is probably the watch moving around due to a bump or me just moving my hand around. You can also pair cadence and speed sensors (being Bluetooth) to track your Cadence. TomTom has tested this with their own sensor and the Wahoo Blue SC. The supported list is here. Overall, the Spark does just fine and it’s a decent computer to use on the bike. You can also get a bike mount for it, but then you loose the Cardio (if it’s on your device). The Runner 2 does not support HR during swimming and thus does not switch on the LEDs on the back. I’ve tried to trick it with the ‘workout’ mode, but the results were not there. Water distortion, lights, everything makes measuring HR a pretty impossible task while swimming using an optical sensor I’ve tried this before with other watches with very similar results. Once you start the session you can set the pool length (in meters or yards) and you can go as short as 15m or yards. The maximum lane length is 615. I’ve never been to a pool with that length (except for San Alfonso del Mar), and if you have, consider yourself lucky and send me the address! The watch recognises and counts the lengths you swim, but note that you do need a proper push off. All watches use this change in direction as to count the start of a length. Whether you do a touch and go or tumble turn doesn’t matter as long as you give is a good push. Counting the lengths is pretty accurate. I’ve seen it miss an occasional one, but I’ve seen that happen on all watches. For swimming you can set Goals (Distance, Time or Calories), create a quick interval training with a warmup a sets of work & rest and a cooldown. Of all four you can choose if the part is determined by either time or distance. You can also decide what you want to see in the bottom two values. The data given in the app and online is rather limited. 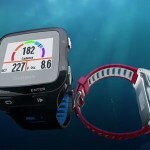 No lap distance, or lengths, even though it does display on the watch and no stroke recognition. In case you were wondering, it’s kinda obvious, but the swim mode does not support music. 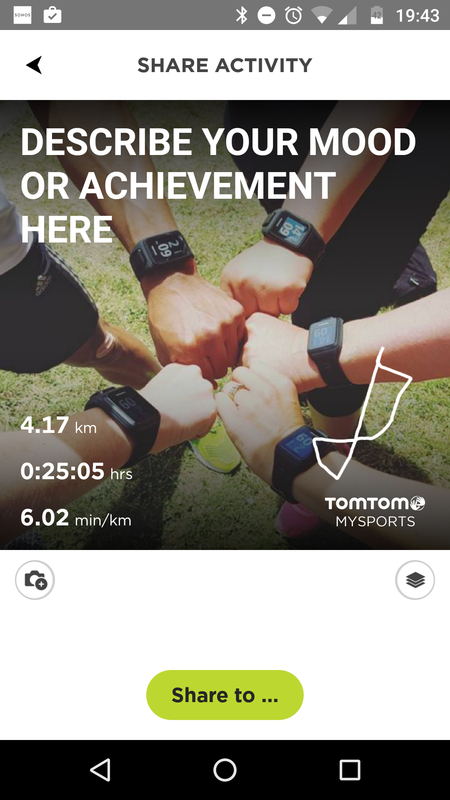 With TomTom’s companion app, you can see your workouts to a bigger detail and automatically synchronise your workouts to Strava, Endomondo, RunKeeper, Jawbone, MapMyFitness, MyFitnessPal, Nike+, TaiwanMySports (wut?) and TrainingPeaks. I’m not really impressed with the synchronisation, getting the watch to synchronise is complicated (there’s no ‘sync now’ option) and sometimes this takes really long. 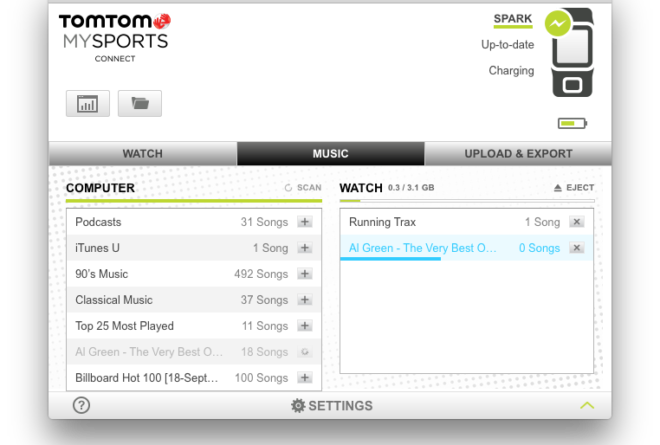 The online tool of TomTom is decent, and good enough for starters and getting the basic information. Not that they haven’t invested a lot of time, but if you ask me, why would they? The online sports market is completely saturated and everybody is using a different preferred app with their friends anyway. They have teamed up with MapMyFitness but personally I believe that’s a service that is to pushy for payments if you ask me (you can’t even see a HR graph without paying). 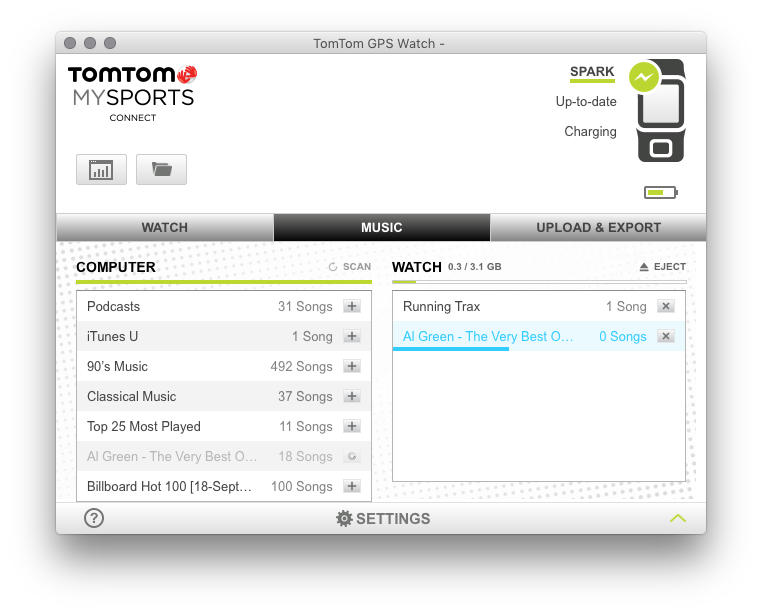 But TomTom’s own MySports is decent and the option to automatically synchronise to the most popular sites completely solves any problem you may have with it. You get the laps, the averages of speed, hr and cadence. And on laps you get speed, pace, hr, elevation and cadence. A hover shows the HR and where you were. So basically you get all the data you need to see how you performed. The same goes for running. A decent screen providing insight in your session. The app just got updated with, what I think is the coolest feature of it! Instant share to Instagram! I love Instagram and you can follow me here. After you’re done you can pick a session and via the ‘share’ option. You can now take a photo or pick one from your gallery. The app will then overlay your data, a GPS layout and you can add some text. There are probably plenty of other apps that do this too, but this is just too easy! First of I have to admit I’m not convinced by activity tracking. It’s a nice bonus, but don’t expect me to say buy an activity tracker. 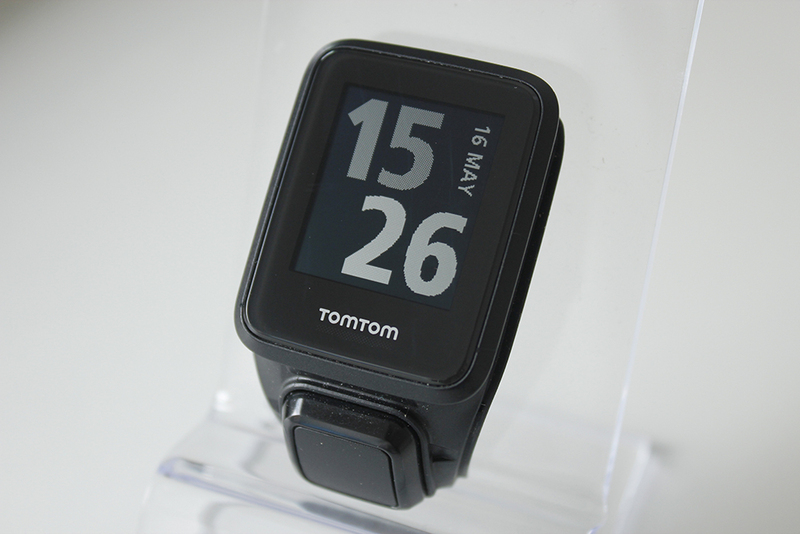 Anyway, the TomTom Spark looks like a watch you can wear day in day out, and I’ve done so for a couple of weeks too. 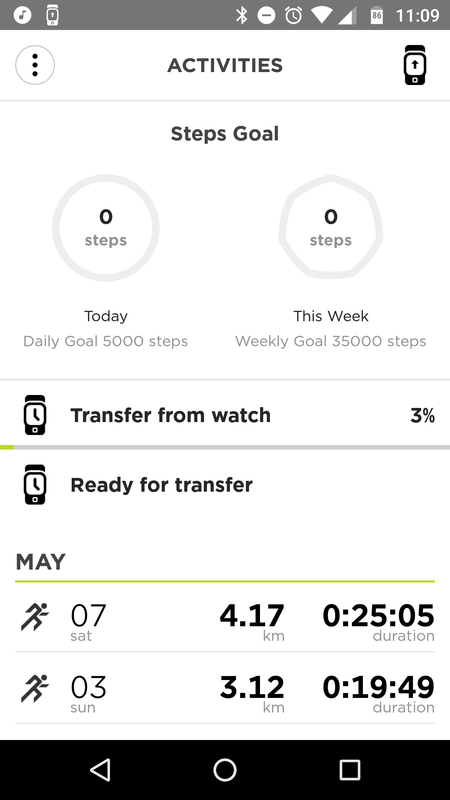 The added bonus of activity tracking gives you an insight how much of a couch potato you are when you’re not working out. So maybe it will make you think twice about binging that bag of chips. 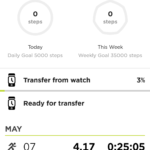 After a firmware update, TomTom added support for HR tracking throughout the day. So the tracking is HR, Steps, Calories, active time and the amount of sleep you get. Normally a table of models would make sense, except that the naming convention for the Spark is so plain simple that I was making the table and decided it was overkill. The base Spark model is just a GPS watch, no HR, no Music. Then every extra is optional. You have the +Music and the +Cardio which have the music player and HR built in respectively. Then you also have the +Music+Cardio, which, you guessed it, has both. The very last version is the +Music+Cardio+Headset. Again unsurprisingly, comes with a bluetooth headset. If you do like tables, there is one below, and it shows the latest price tags. In conclusion I’ve grown pretty fond of the Spark. I like to take it on my runs as it’s a quick way to just go out. Listen to some tunes and not have to find an HR monitor and so on. The watch is very simple to navigate and understand and tracks a good amount of data for beginner or average level athletes. At the presentation I was told ‘every addition is €50’ (~$50 US) but it’s obviously still up to the retailer to set the actual price. If you want to buy the TomTom Spark, please use one of these links as I get a small fee for your purchase which allows me to maintain this blog! And, that’s it! I hope this was informative and if you have any questions, drop them below. Happy training! agreed. I think the spark is doing pretty well in the marketplace too. When did the Instagram share thing get updated? I think I missed that one. I think it was just last week. I picked it up in the changelog! Thanks for that. I can’t chip in on long or intense use, as I use various devices so my long term experiences are a bit skewed (I use it far less than a single device owner). But interesting to hear your experience. Did the little plugs come off? That’s what I would expect when you mention it breaks. As for HR, I don’t believe the HR is too far off as stated in my cycling paragraph, it’s not as accurate as a chest strap, but all optical HR monitors have the same issues. And on the topic of calories, never trust what any device tells you, they all just a guess based on algorithms or lookup tables, more data is probably more accurate but without all conditions and values it’s still a guess. I’ve seen differences of 200% on devices on the same ride.